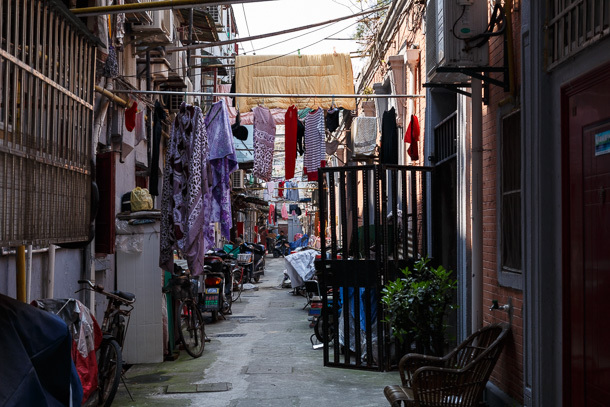 Shanghai Sketches is an ongoing series documenting urbanization in Shanghai, with emphasis on urban planning, mobility, shared spaces and street culture. Subject and topic-wise, it shares much with The Tokyo Project and my other pieces on transit and neighborhoods in Japan. Where I hope to deviate a bit is with regard to format. 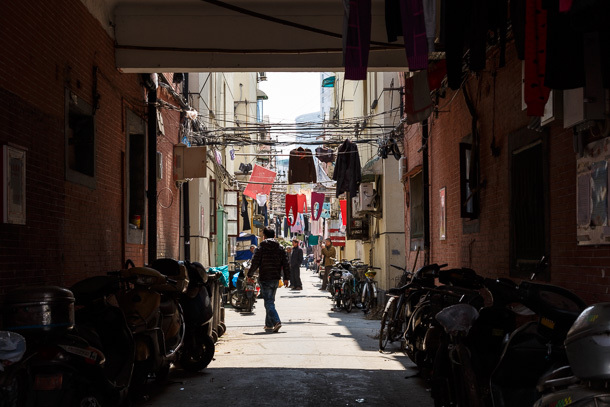 Where my Japan pieces tend to be as comprehensively photographed, filmed and researched as time permits, I’d like Shanghai Sketches to be more loosely defined. One reason is that, while I’ve been writing about urbanism in Japan and in Japanese animation for a few years, I’m just getting to know how things work in China. It will take some time for me to learn how best to explore, document and research neighborhoods here. The other is that, where I generally travel to Japan for intensive field study sessions, planned out in advance, Shanghai is home. I’d like to work the photography into my daily routine, so sometimes I may just have a small slice of a neighborhood or a particularly interesting moment to share, rather than an exhaustive photo essay or area history. 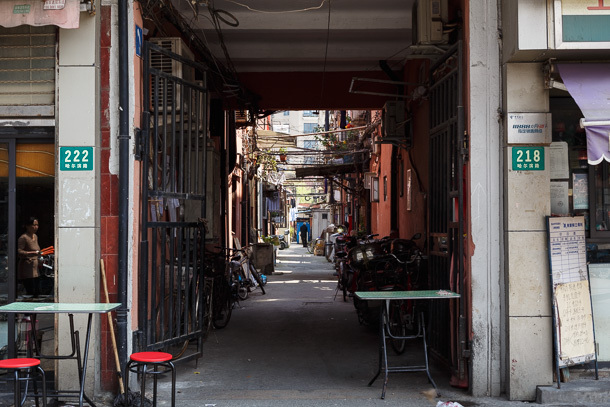 While my Chinese language level is enough to allow me to do some basic research online and ask questions when I’m out and about, I would be completely lost were it not for the many years of work by Sue Anne Tay at Shanghai Street Stories. 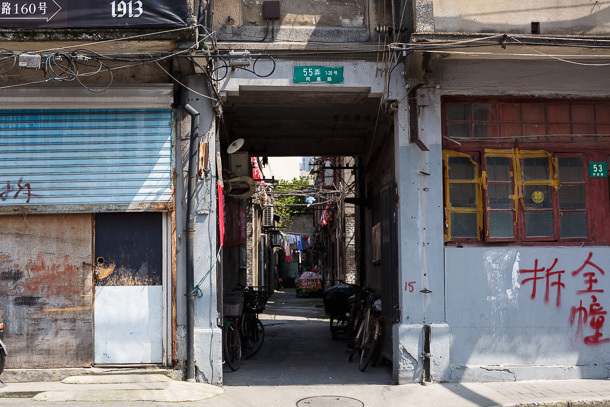 Her volumes of photography and writing on the changing landscape of the city, with particular emphasis on shikumen (石库门) architecture and lilong (里弄) culture, were my windows into Shanghai long before I had any idea I would be counting myself among its residents. This humble student looks forward to following in her shadow, and hopefully finding my own particular beat. Right from the start in this inaugural post, I encountered the first and very fundamental challenge of how to name the place I plan to describe. I like to enable other explorers to find these places to see for themselves, but place names also often tell us something about the origin of a neighborhood. Large cities in China usually have qu (区), just like a ku (区) in Japan, though qu gets translated as district while ku becomes ward in English. Qu are large, so we need something finer. In Japan, below ku are a handful of formal municipalities, further subdivided into chōme numbers, all the way down to block and unit numbers to complete an address. With this, you can be as specific as you require with regard to location bounds. There are also the informal, casual place names that overlay the postal districts. Generally, people will be familiar with whichever system you use. In China, qu have subdivisions called jiedao (街道). 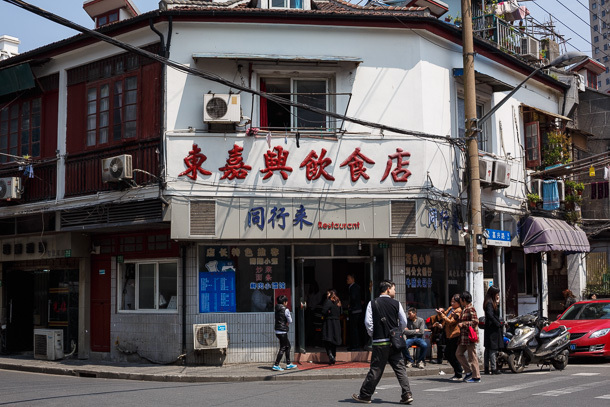 Jiedao can have useful information about a place embedded in their names, but they have one problem—many people here are not familiar with them, and don’t need to be. 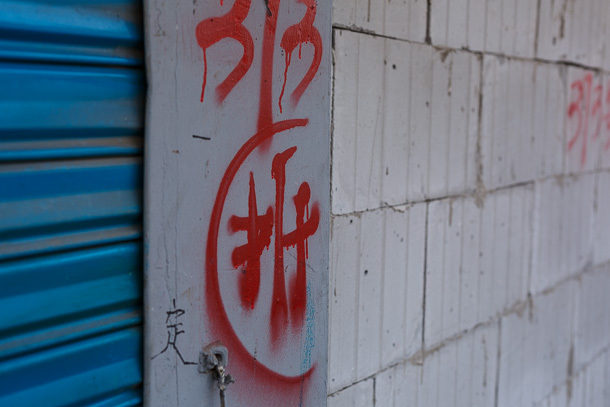 Jiedao aren’t used in formal addresses, only qu is used, followed by street and lane names and numbers. I’m not even sure of the name of my own jiedao. Baidu Maps shows what appears to be informal neighborhood names, quite a few of which just use the name of a large street going through the area. 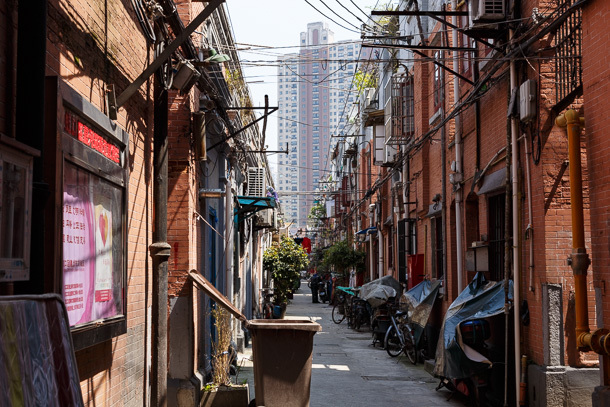 The problem with these is that it isn’t always very clear how much area they cover, and large portions of the Shanghai map, especially further away from the old city center, don’t have any tags at all. For lilong, the main road name and lane number actually do a pretty good job of demarcating a space, but for everywhere else I’ll have to learn as I go and ask for help on this. 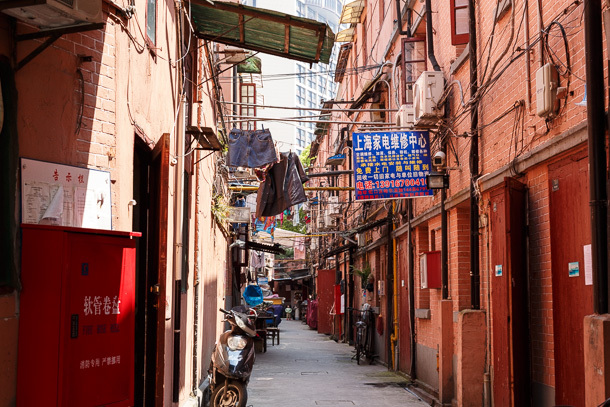 On this particular trip, I made a short walk around a neighborhood in Hongkou District (虹口区) while out on an errand. 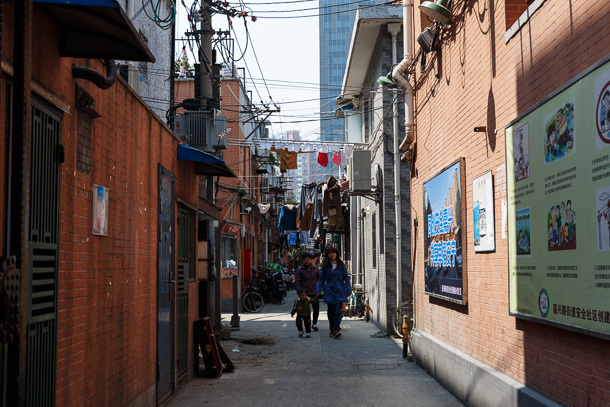 The route goes from Ha’erbin Lu through Hailun Lu and Siping Lu returning to the metro Hailun Road Station. The area appears to be in Sichuan Bei Lu Jiedao (四川北路街道), along the border with the more well-known Tilanqiao Jiedao (提篮桥街道), though neither Google nor Baidu show the formal boundaries. Finding a map with jiedao is now on my to-do list. 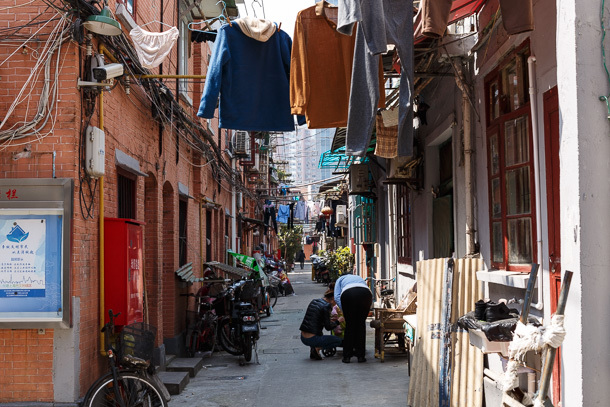 This part of Shanghai became a home for Jewish refugees that had fled Russia during the 1917 revolution, from Ha’erbin during the Japanese occupation in 1931, and Nazi-occupied Europe during World War II. 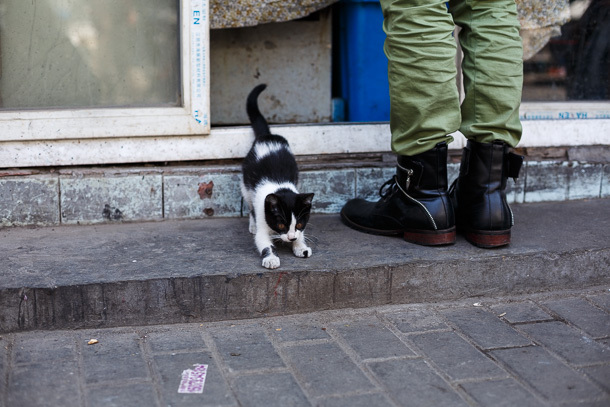 Many left Mainland China during the civil war that led to the 1949 Communist takeover. 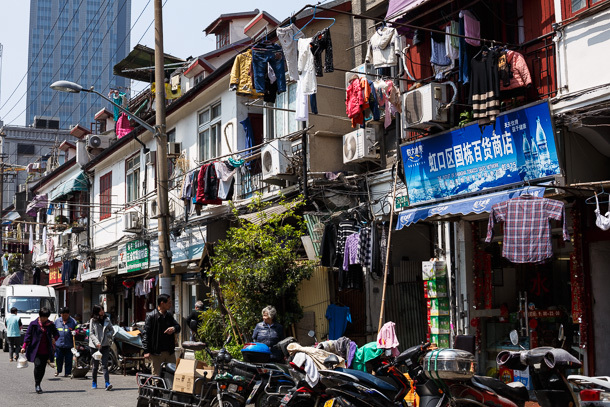 On the left side of Ha’erbin Lu is the Ha’erbin Building (哈尔滨大楼). The structure began as a sawmill operated by Americans, at one point becoming housing for refugees, and later converted to a factory after 1949. The building, now a retail and commercial office space, has a detailed history of the uses on the wall in one of its staircases. I’ll make sure to take better notes if I’m back in the area. 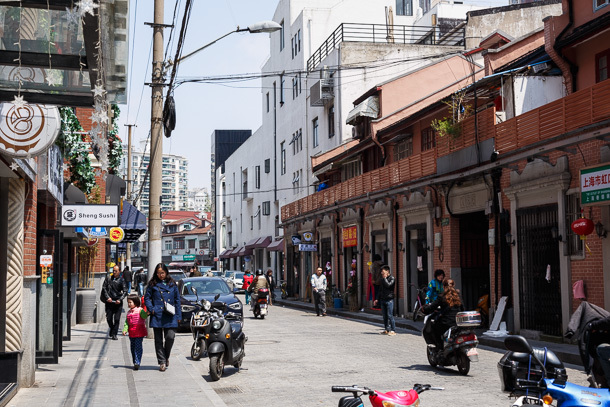 This part of the jiedao, south of the Ha’erbin Lu Bridge, is rapidly being renovated or completely plowed over for new construction. 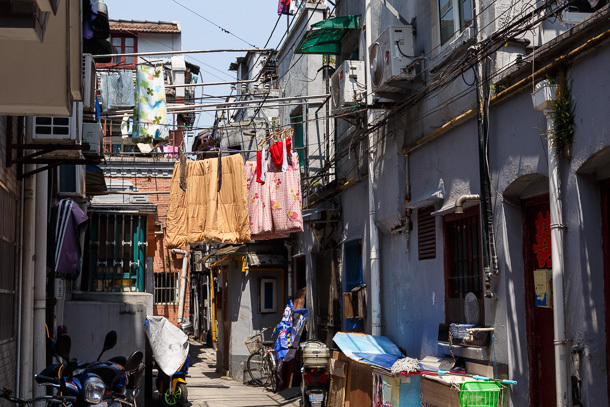 North of the bridge, original lilong neighborhoods remain. Some, like this one, are in very good condition and appear to be fully populated. 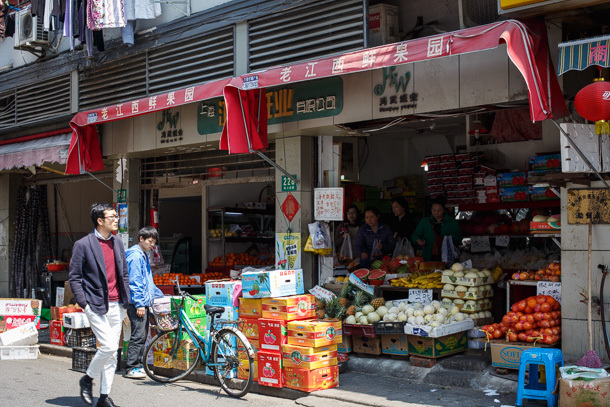 Ha’erbin Lu north of the bridge is lined with small grocers, services and restaurants. 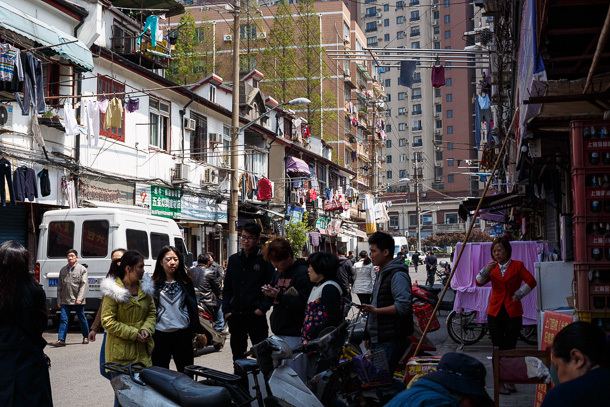 Street activity seems to concentrate in this one block of Jiaxing Lu. 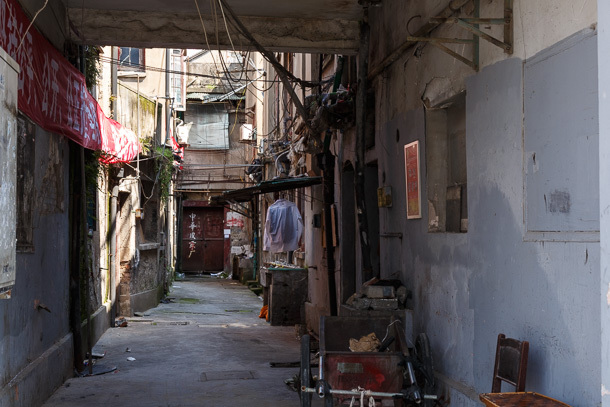 Early afternoon is frequently utilized for napping among retired Chinese, but signs of life still dot the lilong lanes. 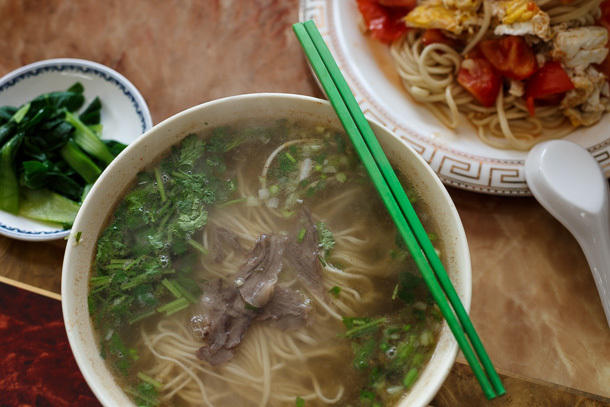 Late lunch stop at a halal noodle shop run by Hui, China’s mostly Muslim ethnic group. 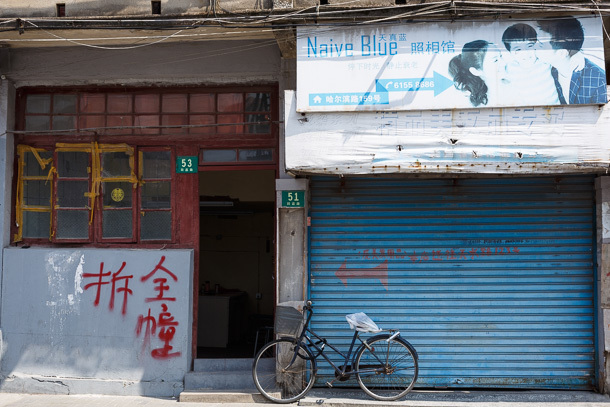 As I approach the north end of Ha’erbin Lu, the state of shopfronts becomes more desolate. 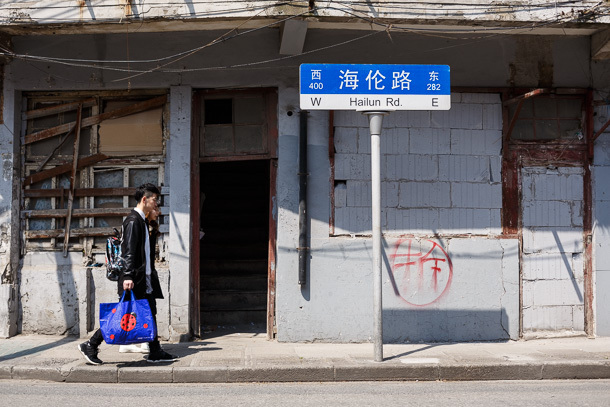 Once you round the corner onto Hailun Lu, many are crumbling and marked with chai (拆)—slated for demolition. 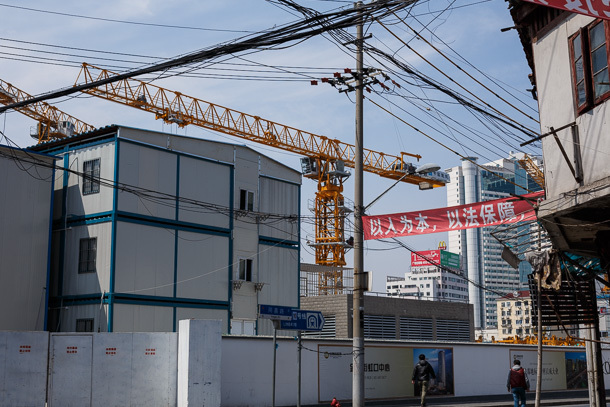 Near the station, cranes busily prepare the foundation for what’s to replace this old neighborhood. Even across the street from the construction and amid chai markings on most of the doors, clothes and bicycles hint of some determined to hold out until the very end.